Welcome to Dr Whisher’s Blog site! I am a small animal veterinarian at North Lake Veterinary clinic. I got my B.S. in Biology (Neurobiology) and my DVM (Doctor of Vet Medicine) in New York at Cornell University. I also met my husband at Cornell (he’s an equine veterinarian). After graduation, I practiced emergency, critical care and preventative medicine in Fairfax, VA and then in Columbus, OH. My husband and I moved to Wisconsin this past summer. As a child growing up, my family were animal enthusiasts and we always had pets. My mother will tell you from as far back as she can remember, I wanted to be a vet. 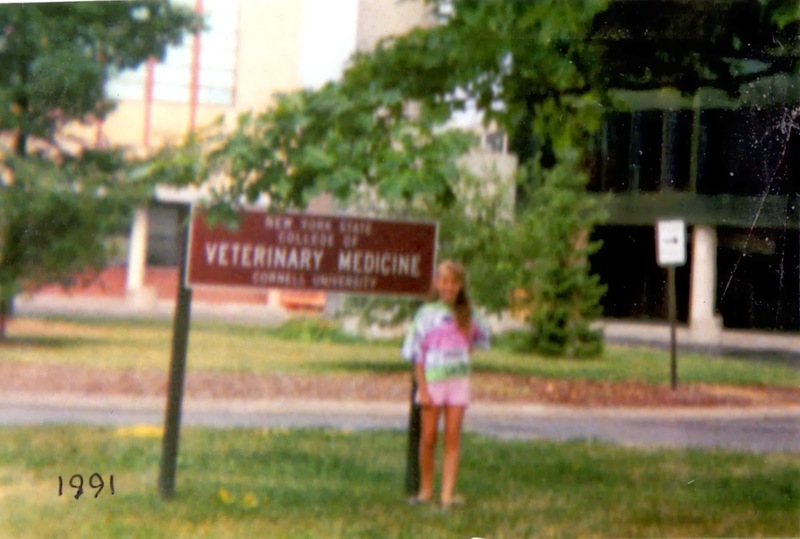 Here is a picture of me at age 10 standing in front of the Cornell vet school where I told my mom I would go to become a vet someday. 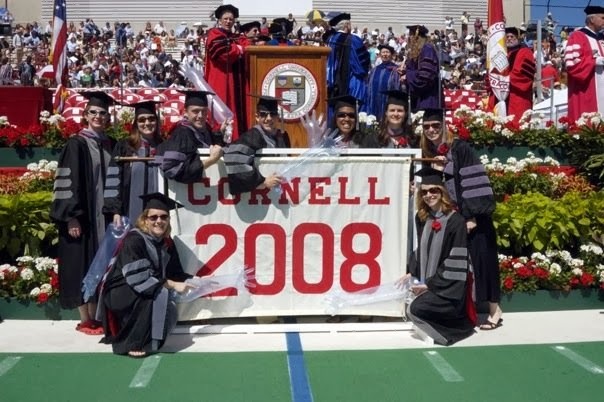 Here is a picture 17 years later with veterinary friends at graduation. Goal #1: Education! A powerful tool to make the most informed decisions. I think the best way to explain the importance of education is to share a heart wrenching story from my own childhood. As a veterinarian, it’s one that I have since seen repeated multiple times by my clients and it tears at my heart every time. If I knew then what I know now, things may have turned out differently for our dog… so if this story can help one person out there, I will feel like this blog is worth it. 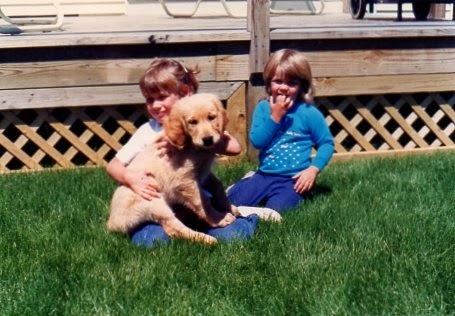 Let me introduce my first dog, “Copper”, a sweet golden retriever who played endless hours with my sister and me in our back yard. Copper was the best dog a kid could ask for. 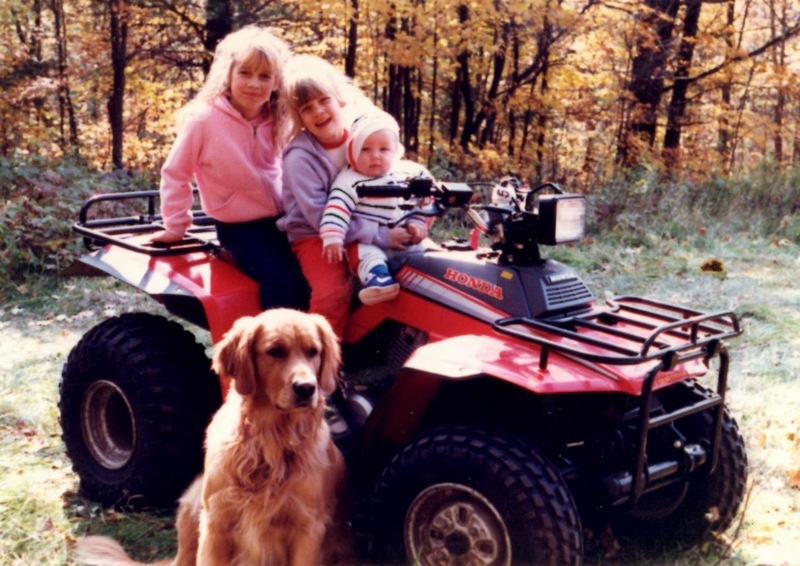 This is a picture of him full grown with my brother, sister and I near our cabin in the Adirondacks (upstate NY). When I was 7 years old my parents separated and later divorced, so Copper lived at my dad’s house. One evening we were spending the night at my dad’s house. We all ate dinner (including Copper), then decided we should take Copper for a walk. We decided to take him for an extra long walk to make up for not getting a lot of exercise lately. Everyone was in good spirits going to bed that night. The following morning we went downstairs and Copper was acting funny. He hadn’t slept in my dad’s room like he usually did. He didn’t want to get up when we called him. When we finally got him to stand, he whimpered and his abdomen/stomach looked a little bigger than normal. He didn’t want breakfast, which was very strange. We weren’t sure what was wrong with Copper. Since we kids had to get to school my dad told us he would drive us like usual, then go back home to check on Copper. When he arrived, Copper was dead. He was shocked and devastated. Later when he broke the news to us, that was one of the first times I saw him cry. Copper likely died of a GDV, a condition many people are not aware exists. GDV, or Gastric Dilatation Volvulus, is when the stomach fills up with gas (bloats) and twists on itself. Who: Large breed, older, deep chested dogs are the most at risk, although any dog can be a victim. Signs: Panting, vomiting or dry heaving, abdominal/stomach enlargement, pacing, discomfort. What to do: If you suspect your dog has GDV, call your veterinarian (or emergency vet if can’t reach your vet) immediately! If they also suspect GDV, get your dog to them ASAP! Time is not on our side in these cases. These pets can die very suddenly. If your veterinarian examines your dog and confirms GDV (usually by x-ray), they will discuss doing emergency surgery to decompress, untwist and tack the stomach. How to decrease the risk of GDV? -Try to feed your dog smaller, more frequent meals. 2-3 small meals a day is always better than 1 large meal. – Sometimes you do everything right and a GDV still can occur- remember, it’s not your fault. Here is how I feed my own dog, Logan. This way it takes him 15 minutes to eat his meal instead of 15 seconds. Plus its good entertainment for Riley the cat! Goal 2: Share days in the life of a veterinarian. Have you ever wondered what goes on behind the exam room door? We will show you some interesting cases, cute pictures, important procedures and diagnostics.